Возможно, глупый вопрос, но я уже в тупике. что делать с этой строчкой? При компилировании любого файла возникает. Т.е никакая написанная программа гхм. не работает. Переустановка не помогает. Диск G - компакт-диск? Возможно компилятор не может создать временные файлы в папке программы, доступной только для чтения? Что если попробовать переместить программу на жесткий диск? 11.05.10 12:28Ответ на сообщение Не шарю в с++ пользователя S.S.A. G здесь флешка. не, при запуске с жесткого диска такая же реакция. может, какие-нибудь файлы в application data надо найти-удалить? Update: this problem should be solved completely in Dev-C++ 4.9.9.2. If you don't want to upgrade, or somehow you still get the error in 4.9.9.2, read on. This happens when the IDE can't find one of the programs needed for compiling your file/project (usually it is make, gcc or g++). The most common cause is a nasty BUG in the Dev-C++ installation system: the uninstaller doesn't remove the Dev-C++ configuration files, and the installer doesn't overwrite them. So if you try to install Dev-C++ in a different folder without following these instructions, you will most likely get this error for everything you try to compile. 1. The "blind reinstall" solution: uninstall Dev-C++ cleanly (pay special attention to the devcpp.ini and devcpp.cfg files if you have Dev-C++ 4.9.x.x), then reinstall the full latest version (see top of this page) in a folder with no spaces in the path. It should work afterwards. 2. The "smart fix" solution: read the compile log to see which program it tried to run; go to Tools - Compiler Options - Programs and see what file it is looking for and in which folder (click the "..." button) and check if it is found in that folder. 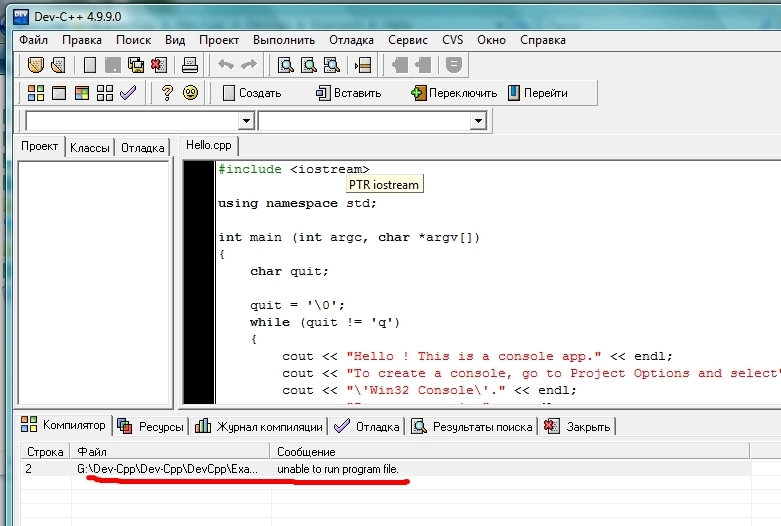 If the specified file is not there, then select it from the Dev-cpp\bin folder (or wherever you installed your compiler). It might also help to set Tools - Compiler Options - Directories - Binaries correctly. Note: if you downloaded the IDE-only version (~2 MB) and you didn't install a gcc compiler (e.g. the mingw package), then you won't find the necessary programs; refer to solution 1.